A compact design houses 3 AC outlets and 3 high-powered USB ports. Light and compact to go where you go, PowerPort Cube is the ultimate space-saving power station for your appliances and mobile devices. 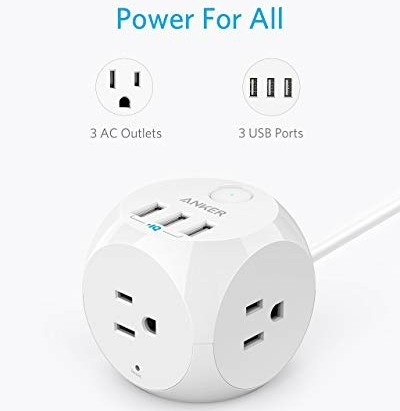 3 AC outlets and 3 USB ports power everything on your desk from a single compact hub (18W max output from the USB ports and 1250W from the AC outlets). Less than 2 ½ cubic inches, for maximum space-saving at home or in your travel bag. Deliver an optimized charge to USB devices with Anker’s world-renowned PowerIQ technology. Overload protection and a fire-retardant casing ensure complete protection for you and your devices. We can’t remember the last time a librarian stamped a date in the back of a book we checked out, but we can remember the smell of cracking that hardcover when we got home. 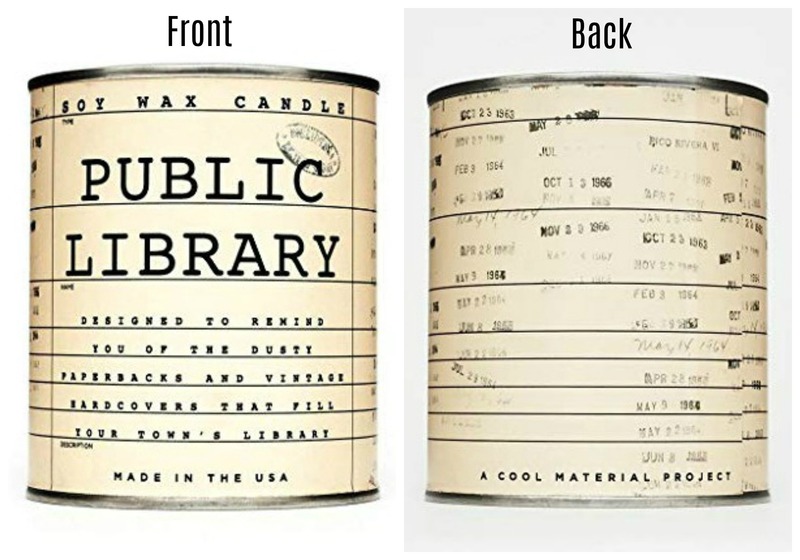 The Public Library Candle is meant to evoke the smell of a dusty, old book. It will bring to mind the rows of well-worn novels, biographies, and pieces of writing that fill the shelves of your local library. Light the 100% soy wax candle and settle in with your favorite paperback book. Fire TV Cube is the first hands-free streaming media player with Alexa, delivering an all-in-one entertainment experience. From across the room just say, “Alexa, play Billions” and Fire TV Cube turns on your TV and starts playing the SHOWTIME drama, allowing you to control your entertainment with voice commands. Watch as thousands of movies and TV episodes come to life with vibrant colors and detailed contrast in 4K Ultra HD and HDR. With far-field voice recognition, eight microphones, and beamforming technology, Fire TV Cube hears you from any direction. From across the room, just ask Alexa to turn on the TV, adjust the volume, and control playback. 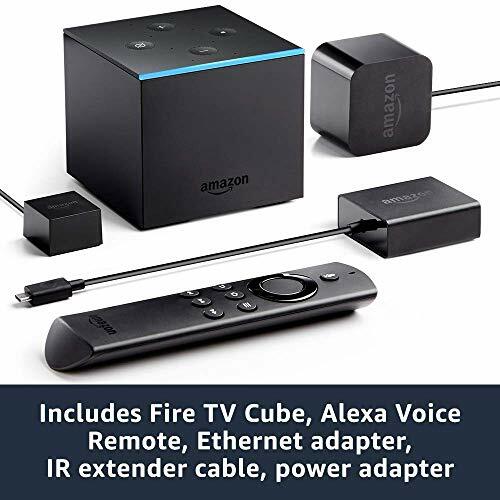 Fire TV Cube also comes with the Alexa Voice Remote with TV and volume controls, for when you want to control your TV without making a sound. With Morpilot Shower speaker, you can listen to the music and even answer the phone call during the shower. The speaker will ring when there is an incoming phone call. When you finish the call, the audio will resume playing. 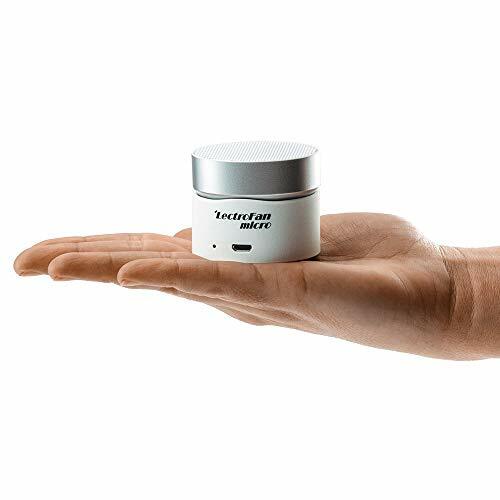 The wireless speak can operate up to 10 hours of music or phone call. Powerful & Energy saving—3 times more spray power than a standard shower head but save up to 30% of water (Flow rate 2.5GPM). Easy and Fast installation—Can connect to any standard bath shower hose easily(G1/2 UK unsealed thread, bore diameter 1/2 inch, 12.7 mm, thread outside diameter 20.955 mm). Even and strong water pressure. Top Quality—Made of high quality material, super anti rust ,Leak proof and durable. Easy to clean. Supports Bluetooth v3.0 + EDR enabled devices. You can listen to the music and even answer the phone call during the shower. Delivers up to 11.5 hours of music by pairing wirelessly up 33 feet away with your bluetooth-enabled device. With 1100mA rechargeable Battery & USB charging cable. 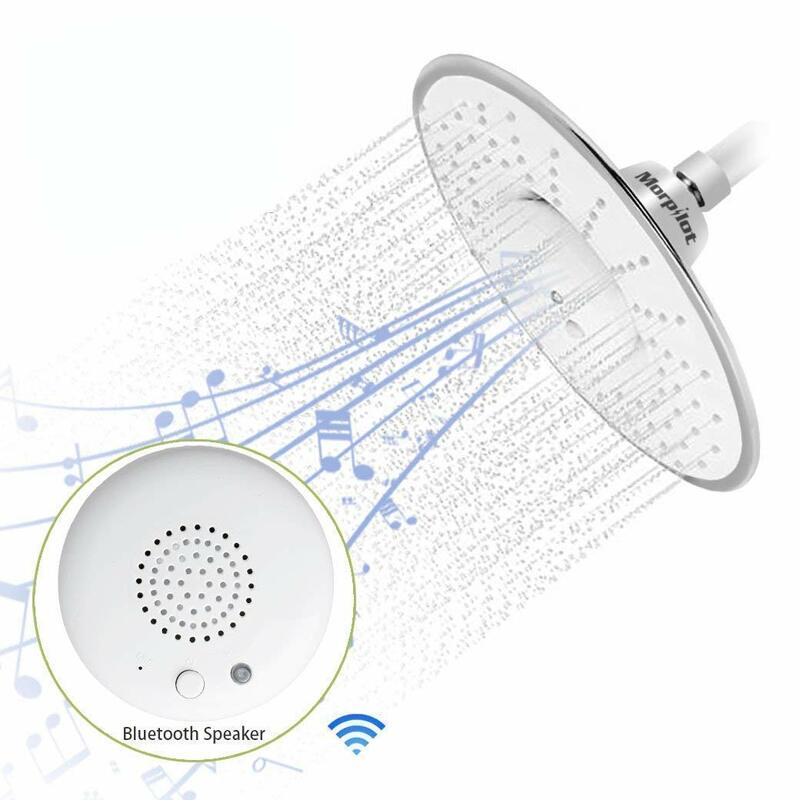 Shower speaker can be used outside the shower space, independent of the showerhead, to stream music in any room. Outstanding RF power amplifier performance. Simulated dual microphone noise reduction. Pickup technology for background noise cancellation. Superior Sound Quality gives you a wonderful listening experience. 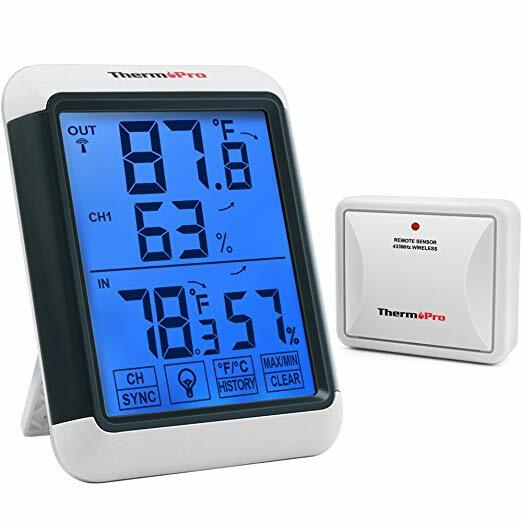 Equipped with professional grade sensors, the ThermoPro TP65 thermometer provides the most accurate measurements, be it for indoor humidity or temperature, allowing you to be aware if adjustments are necessary for your household. The indoor thermometer and humidity gauge is not just highly accurate but extremely user friendly with a backlight for those last-minute nighttime checks on current readings before bed. That’s not all, no longer will it be necessary to unmount the device off your wall or fridge to switch settings, simply use the sleek touchscreen display. Furthermore, this temperature gauge provides an abundance of valuable information,such as displaying 24 hour/all-time high/low records and current trends for both humidity and temperature and humidity level icons that indicate if your home is too humid, too dry or just right! 1.Large Screen with Huge Digits displays the current indoor-outdoor temperature and humidity percentages. 2. Blue backlight is bright and makes the screen easy to read in low light when activated, and automatically turns off after 15 seconds. 3. Being able to adjust settings with the touchscreen display instead of taking the device off the wall or fridge. 4. Temperature and humidity trend indicators. 5. Includes all-time / 24 hours high and low records for temperature and humidity. 6. Easily reset the temperature and humidity with the press of one front facing button. 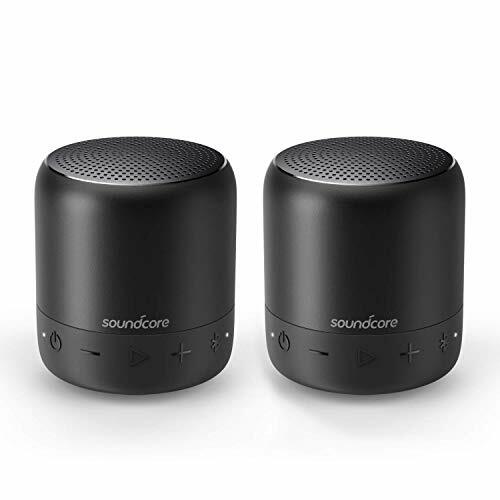 Soundcore Mini 2 [2-Pack] Two Pocket-Sized Speakers for Big Stereo Sound. Expand Your Sound This 2-pack puts Mini 2’s wireless stereo pairing feature center-stage. Pair both speakers via a single Bluetooth device for huge stereo sound. For optimal performance, position speakers within 16 ft (5 m) of each other. Sound Bigger Than Its Size Each Mini 2 has a customized 6W driver and exclusive BassUp technology to supply sound that defies its compact size. Fill the room with full-bodied audio; crisp, clear highs and deep, rich lows. IPX7 Waterproof Protection The exterior casing offers impenetrable protection against water, rain, dust, mud and more. Mini 2 even withstands being submerged in up to 3.3 ft (1 m) of water for 30 minutes. Non-Stop Music 15 hours of non-stop entertainment is powered by a high-performance lithium-polymer battery and Anker’s superior power management technology. Soundtrack your car ride, beach party and even the ride home—all without running out of power. Play Anywhere Mini 2’s sleek metal finish with non-slip rubber base is robust, yet lightweight. Fit one in each pocket, or store both in your bag and still have space to spare. Enhanced Connectivity Bluetooth 4.2 ensures a strong, skip-free connection up to 66 ft away, while the built-in microphone allows handsfree calls. BEST STORAGE SOLUTION – Perfect storage and cover for power strips, surge protectors and cables in one convenient place. Our cable box organizer is designed to fit almost every size of power strip with extra space for the cords, adapters etc. 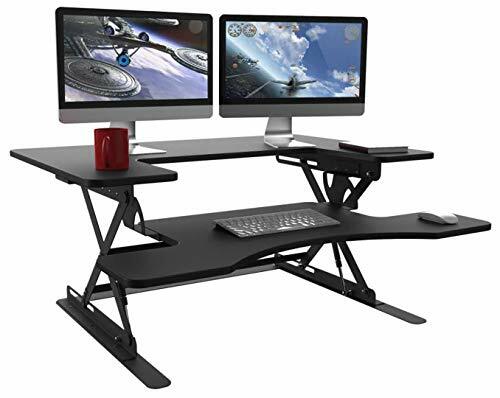 KIDS & PET FRIENDLY – Protect kids and pets from directly touching the power strips and other electrical equipment and at the same time reclaim lost floor and desk space with a simple, aesthetic and elegant solution for cable and cord management. LIFETIME GUARANTEE – Our motto is “Give them Quality. That’s the best kind of advertising”. We want happy & satisfied, that’s why we’re giving you a full refund or replacement for life to ensure premium craftsmanship although we are always happy to resolve whichever problem occurs. PRACTICAL – Four Cable Cutouts with fireproof ABS material allows you to safely manage and customize your cord organization or clean-up effort. Rubber feet for a steady hold on the floor or on the desk. 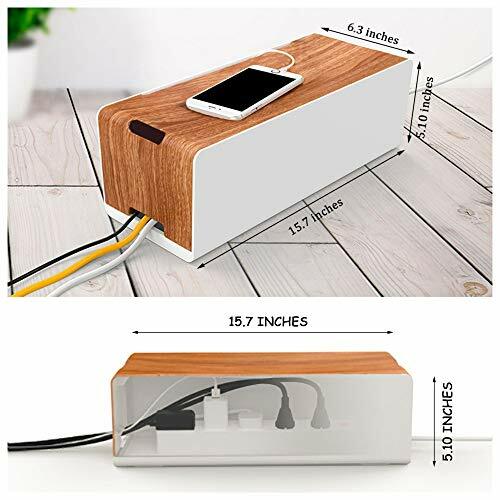 CHARGING STATION – The raised edges on the lid of our Cord Management Organizer provide a safe and convenient place to store your small electronics while charging. 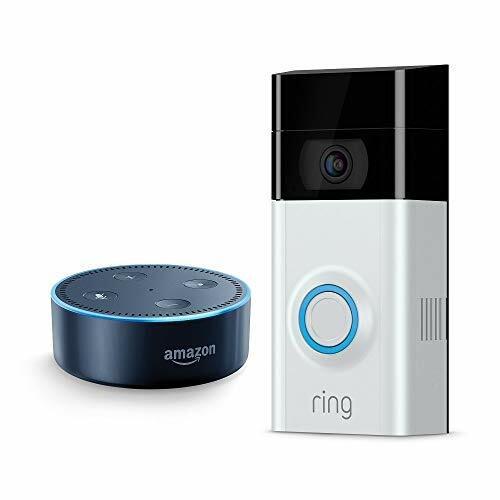 This bundle contains the Ring Video Doorbell 2 and the Echo Dot (2nd Generation). Get next-level security and convenience with the all-new Video Doorbell 2. Armed with motion-activated alerts, 1080HD video and two-way talk, Ring lets you watch over your home and answer the door from anywhere. Day or night, rain or shine – you’re always home. Echo Dot is a hands-free, voice-controlled device with a small built-in speaker. Dot connects to the Alexa Voice Service to play music, make calls, send and receive messages, provide information, news, sports scores, weather, and more—instantly.